The ‘This is Cumbria’ collective has this week launched a new brandmark that will represent the forward-thinking group of businesses at a national event next April. The brand has been launched as the collective make a final call for Cumbrian producers and craftspeople to join them at their inaugural event, the Farm Shop & Deli Show at the NEC 8-10 April 2019. The initiative was formed earlier this year with an aim to create a ‘big impact’ destination stand that could position the very best of Cumbrian food, drink and produce in front of thousands of key buyers. With much of the space already booked, just four trade stands are remaining. Come and join the likes of Hawkshead Relish , Ginger Bakers, Kin Vodka, Tray Bakes, Kendal Mint Liquor and Shed1 Distillery. ‘This is Cumbria’ are also offering a number of affordable ‘Show Case’ stands to developing businesses that are new to national trade shows. Keith Jackson one of the co-organisers from Carlisle-based Thomas Jardine & Co, said “Cumbria is full to the brim with creative people who all share a common bond – they are all inspired by Cumbria to create exceptional things, which comes through in our newly unveiled brand identity. 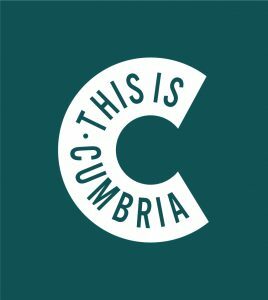 For businesses taking full trade stands at the event, ‘This is Cumbria’ are also offering a number of unique benefits which include pre-show PR and social media build up, inclusion within a dedicated booklet and a drinks reception hosted by celebrity chef, Nigel Barden. England Originals is an amazing new product being launched to help promote our historic cities. Carlisle has played its part, along with 15 other historic cities, to create this unique route to the international visitor market. Recent roadshows held in the USA have received lots of positive feedback from the travel trade and resulted in some key partnerships to help promote England Originals to the trade and independent travellers. 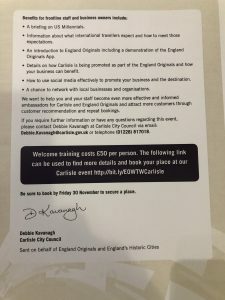 This is an opportunity for our local businesses to be the first to benefit from this kind of training event, which will share product knowledge, demonstrate how Carlisle is being promoted as part of England Originals and provide information about marketing opportunities available to your business through the project.